In the ever-growing world of social media, the way we interact and reach potential consumers is changing. Even some primary staples of social media are constantly evolving to adapt to the cultural, technological, and political climate. For instance, “influencers” are a social media marketing technique on the rise. Influencers are becoming an essential part of any social media marketing for a brand, but how exactly do you connect with them? Let’s take a look at the process of establishing and maintaining relationships with these influencers, and what you can expect with influencer campaigns. Before you start looking for influencers, think about whom you are trying to reach with influencer marketing. What’s the ideal audience for your brand? If you are at a loss for whom to target, look at your previous social media ad demographics for some inspiration. You can glean different specifics like age, gender, interests, and location. All of these aspects of your ads can point you in the right direction of which influencers to target. If you are just starting out and have never created social media ads before, take time to do your research online. For example, if you want to find influencers for a new child’s toy look up ‘toy reviews’ and see who comes up in your search. But what about influencers that aren’t so easy to find? Could there be one that’s important to your category that you’re unaware of? That is where a PR or Marketing firm like Orca comes in. A publicist or marketing professional has the time, expertise and resources to find influencers, reviewers, and blogs across the world. Grabbing the attention of the top influencers will be a goal, but there are many smaller influencers with a devoted following and a better conversion rate to reach ratio. 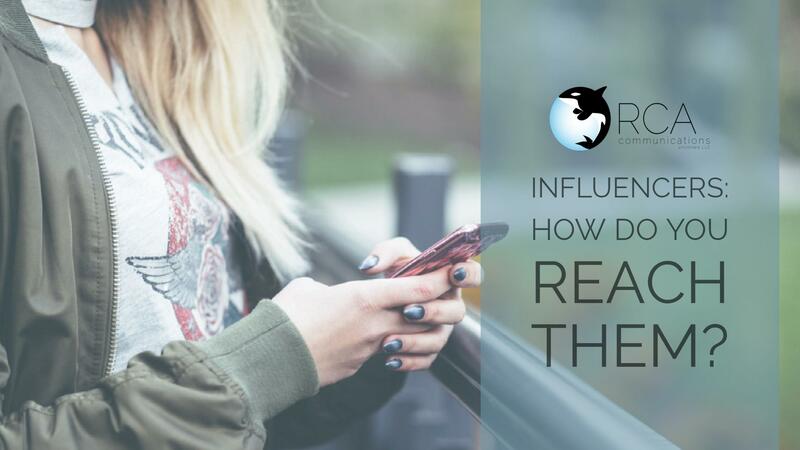 Once you or your PR and Marketing team identify the most fitting influencers, it is time to make contact. At this time, you will discover some pretty significant factors in influencer marketing. Influencers are often quick to get back to inquiries but don’t expect a guaranteed review just because you contacted them. Influencers receive dozens of emails every day from brands all vying for the same exposure. They’ll likely reply with either pricing info (what is usually referred to as a ‘sponsored post’) or a sample request so they can test it out and determine if it’s worthy of sharing with their following. As you begin this journey, bear in mind that many influencers charge money to post or tweet about a product – another term used for this arrangement is ‘pay to play.’ You will want to determine before beginning an influencer campaign if you are 1.) willing to spend money on sponsored posts, and 2.) what your budget is. Regardless of whether it’s a sponsored post or editorial review (meaning no cost involved), all influencers will likely request a product sample. The best content on social media has a visual, and influencers are specialized at making your product look great on camera for their audience. If your product has not come out yet or you do not have samples, it’s best to wait before contacting influencers. If you’re uncertain about targeting influencers, try a few social media ads first to get a feel for your audience and social landscape. Alternatively, you should consider the more traditional route of a public relations campaign to spread the word about your product or service. Influencer programs can certainly be an effective marketing strategy, but they can be one-dimensional, as well. Participating in a PR campaign will raise awareness about your brand on a much broader scale, including national magazines, major news websites, influential bloggers, national/regional TV and more. No matter which way you choose to go, taking an active role in marketing and public relations is sure to yield results!